Developed in conjunction with Lesley University, this engaging resource for fifth grade provides effective, research-based strategies to help teachers differentiate problem solving in the classroom. 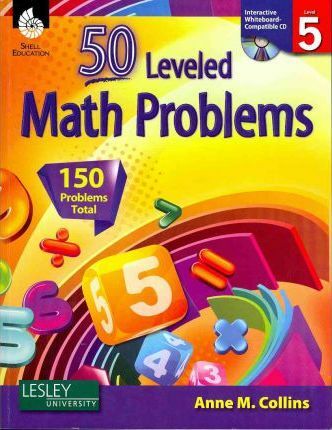 It includes: 50 leveled math problems (150 problems total), an overview of the problem-solving process, and ideas for formative assessment of students' problem-solving abilities. It also includes 50 mini-lessons and a dstudent activity sheet featuring a problem tiered at three levels, plus digital resources that inc electronic versions of activity sheets. This resource was developed with College and Career Readiness in mind,sdssssis aligned to the interdisciplinary themes from the Partnership for 21st Century Skills, and supports core concepts of STEM instruction. Anne M. Collins, Ph.D., is the Director of Mathematics Programs and the Director of Achievement Center for Mathematics at Lesley University. In her career she has taught at the elementary, secondary, and postsecondary levels. Dr. Collins has authored, edited, and reviewed numerous publications on mathematics instruction. Among her many leadership roles and honors, Dr. Collins is an elected member of the NCTM Board of Directors and was inducted into the Massachusetts Mathematics Educators Hall of Fame in 2005.